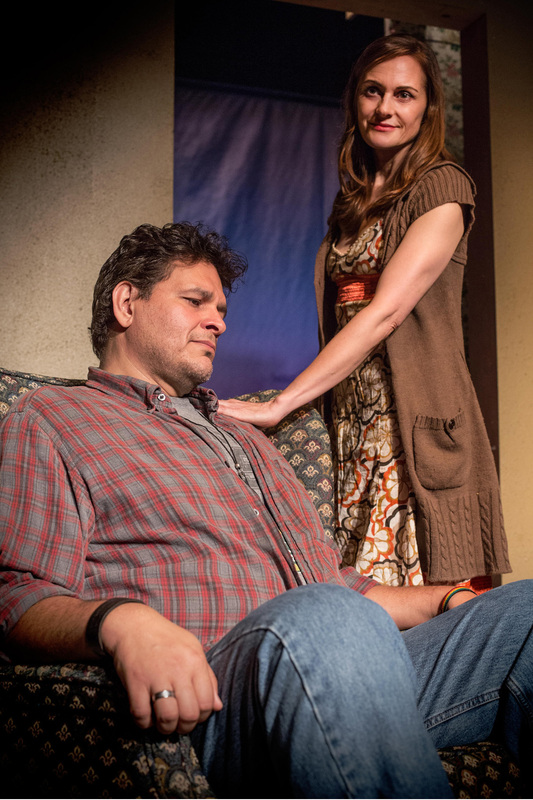 Leandro Cano and Deborah Puette in the Echo Theater Company production of Miki Johnson’s “American Falls” running through October 18 at Atwater Village Theatre. Playwright Miki Johnson makes an extraordinary Los Angeles debut with Echo Theater Company’s West Coast premiere of “American Falls,” her first full-length play. Although “American Falls” has been described as “a kind of modern day ‘Our Town’”, and indeed there are some similarities, it is darker, grittier and far more presentational. Like “Our Town’s” Stage Manager, “American Falls” has a primary narrator in the character of Billy Mound of Clouds (genial, charismatic Leandro Cano), a shoe salesman who knows all the doings of the town with its joys and tragedies. He has shaman-like magic, so he tells us, and receives mysterious information through the soles of his shoes, an inheritance of his local lineage that goes back to the first people. 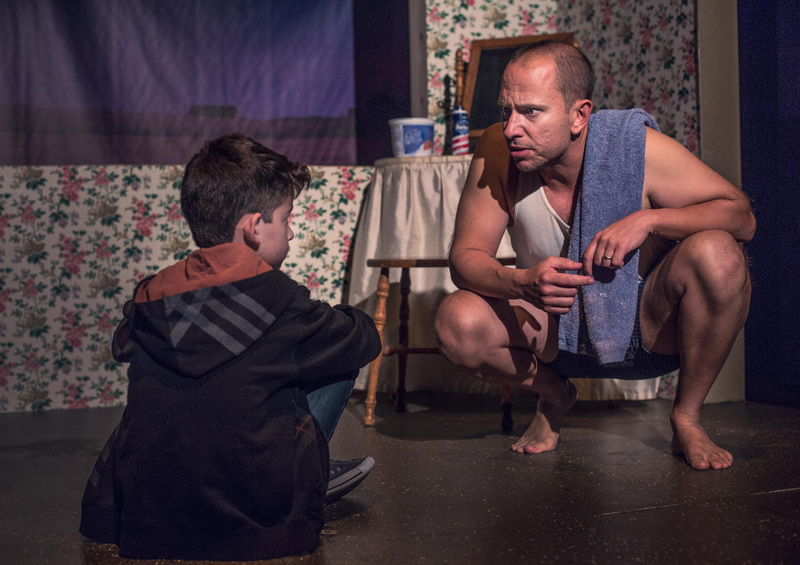 Although “American Falls” is, at its roots, the grim, generational story of a single family and those involved with it, the play is loaded with dark and light humor with topical references provided by Billy’s vast knowledge of the arcana of broadcast television. When the house opens, the cast is seated or standing on the stage in dim light. There are seven actors and as the play unfolds, the story shifts from Billy to other characters, who reveal themselves with their own individual narratives – a recent suicide, her husband, their young son who for most of the play sits stock still before his father with his back to the audience and says not a word, the boy’s grandmother, and a trio of amiable drinkers who serve to back-fill the narrative with local color. The action shifts seamlessly between the players with smooth lighting transitions by Jesse Baldridge that lead the audience’s attention. Tomek Adler and Karl Herlinger in the Echo Theater Company production of Miki Johnson’s “American Falls” running through October 18 at Atwater Village Theatre. As Lisa, the suicide, Deborah Puette carries much of the emotional weight of the play as she relates the circumstances of her roller coaster life and her quest for love. As her bottled-up, abusive husband, Samuel, Karl Herlinger is sinister and creepy in his scenes with his silent young son Isaac (the awesomely focused Tomek Adler). 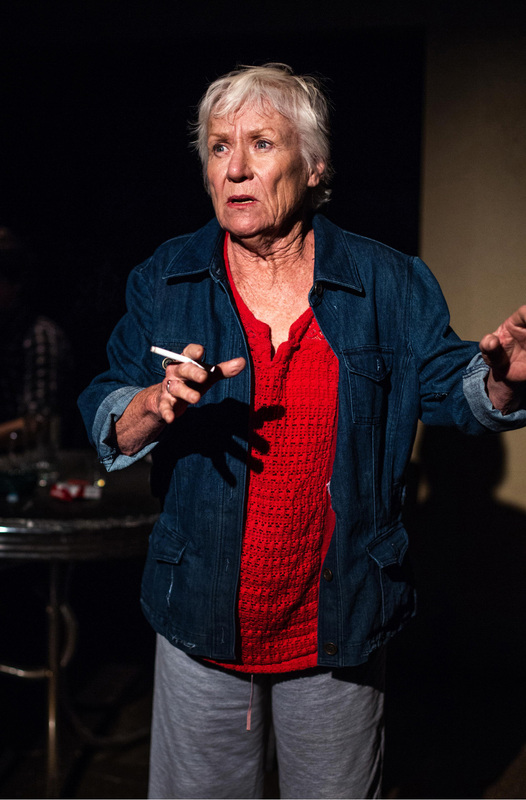 In a performance as easy and unforced as breath, Barbara Tarbuck is simply sensational as Samuel’s mother who details the sordid aspects of her life and the impact of her choices. Barbara Tarbuck in the Echo Theater Company production of Miki Johnson’s “American Falls” running through October 18 at Atwater Village Theatre. Over at the table stage right, the drinkers chug down their beer and shots of Jägermeister, as they relate dreams and incidents from the past. Other characters in the play call Lisa’s lover Eric Dewar handsome or good-looking and Eric Hunicutt fits the bill. His interplay with the husband and wife characters Matt and Maddie (plaid clad, bewhiskered Ian Merrigan and Jessica Goldapple in nurses scrubs) is good-natured to the point of giddiness. These are team players and their chemistry is as spontaneous and playful as a passel of puppies. 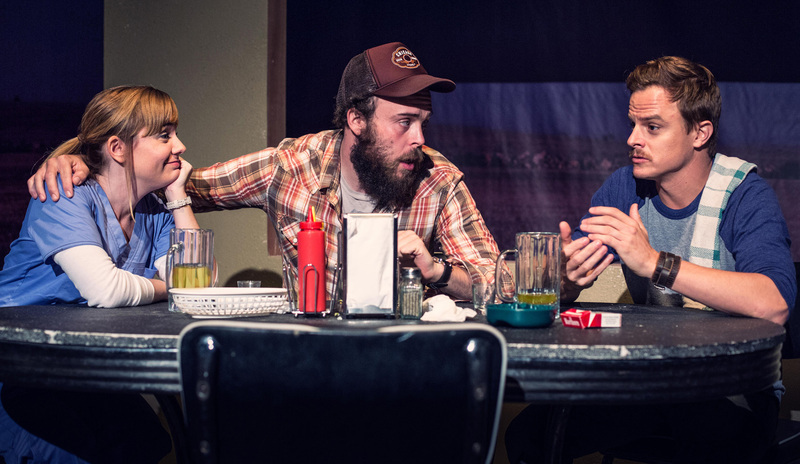 Jessica Goldapple, Ian Merrigan and Eric Hunicutt in the Echo Theater Company production of Miki Johnson’s “American Falls” running through October 18 at Atwater Village Theatre. “American Falls” clocks in at about eighty enthralling minutes. The script is great, the cast superb and the production splendid, all under the tight direction of Chris Fields. One couldn’t ask for more. Note: certain roles are double cast with Andrea Grano alternating as Lisa, Garrett Hanson as Matt, Beth Triffon as Maddie and Michael McColl as Samuel.